During the Titus 2 classes hosted by Country Victorian, we have been listening to a lot of tips on organization. 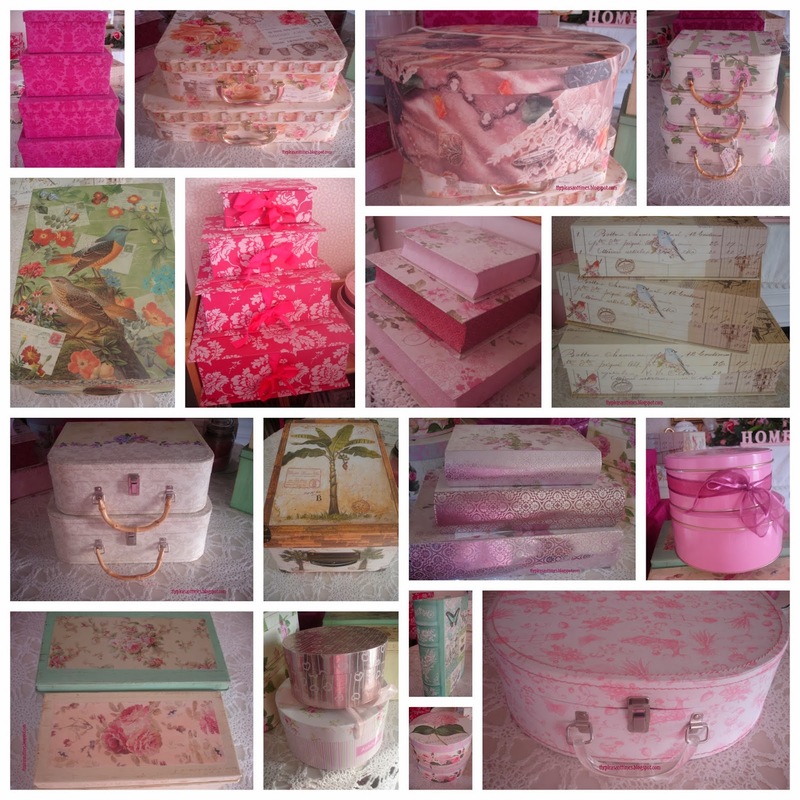 I thought I would show a collection of boxes that are used to help keep clutter down. Some are mine and some are my mother's. Though many are used for organization, I confess that use mine as great places to store "flotsam and jetsam" (you know, those little things that have nowhere to go?) as well as long term keep-sake and holiday storage. We are each building quite a collection! I love to go to TJMaxx and Michael's and look at the aisle of boxes, with matching journals, stationery and other things. It is as tempting as chocolate to buy some-- many a time I have had to use all my will power to resist them. So I began asking for these box sets for birthdays and anniversaries. Here's a closer look at some. There are a few styles here-- first off the suitcases. This cute pink one is perfect for storing little baby girl mementos inside-- the wee shoes and "first" clothing that are outgrown so quickly-- along with a rose-scented sachet. These two suitcases are sewing themed. You would think I would store sewing things in them, but they are being used for books, papers, cd's, etc. Here are two more with bamboo handles. These are empties just waiting for the next pile of orphaned stuff. Here is a set of three. These are have a velvet finish. These tie with ribbons-- they are great for stationery storage. These have a magnetic closure to the lid. I bought these to store children's drawings in; the top one is about letter-paper size, and the bottom big enough for large sketch/watercolor paper size. These two are made of tin. Here they are on the other side, they are just as decorative. This side is easier for opening. They can be stacked or set upright like books. This one holds something sentimental. This one houses a bouquet of dried flowers. It was the perfect place to store them, so they would not gather dust laying around, and they are rather fragile. I've given this one as a gift to start another member of the family on their own box collection! I just loved the print on this one. It houses fabric squares for quilting projects. And these textured graduated boxes house sewing notions. I should label them, shouldn't I? I should store hats in it, I know... but right now it is perfect for Christmas decorations! These graduated tins were found at the dollar store. These two are good-quality boxes that are just packaging, one for a corsage and one for a tea-cup. They can also be used for little things like hair accessories and little bits of craft items, so take a good look at your packaging before you throw it away! Years ago, I tried to find storage boxes that were consistently sized, and cover them myself with wrapping paper, contact paper, or fabric. Above is one I have left, it was a free box from the Avon lady, who always had some she wanted to get rid of. They have been used a lot and so they did not last very long-- shipping boxes are strong but they do "soften" over time and use. These also are rather large boxes, so they are great for bigger items, though if you do not line them they are probably not good for long-term storage. The nice thing about my "birthday" boxes is that they do not have to be hidden away in the attic or under the bed. I am happy collecting the pretty boxes that are not only useful, but can be stacked and displayed in any room, and add to the beauty of the home.